Ben is the new IT ​administrator of a large production company. Soon after joining, Ben learned that the company used outdated software to manage its payroll and used different applications to track employee absences and travel claims. This ​resulted in miscalculation of the amount payable by the company to the employee and ​vice versa. Often, the company paid the employees either more or less than the correct amount, which led to a lot ofchaos. Ben decided to tackle these issues by first implementing a new payroll software solution that came with two integrated modules, an expense module and an HR module. The expense module will track the travel expenses of the employees and the HR module will track the absence and leave types, ensuring accuracy in calculating the amount payable to an employee. First, Ben assigned a technician to collect ​information on the value this change will bring. This technician will be the change requester for this change. 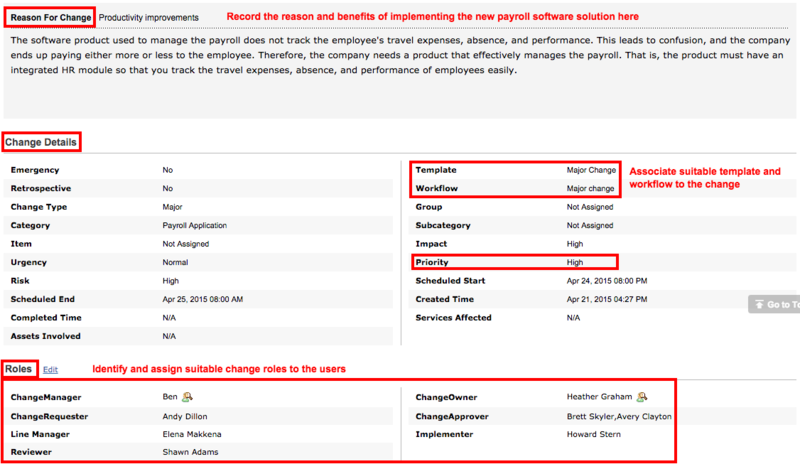 Then, the RFC (request for change) was created with all the required change parameters.​ As you can see from the screenshot below, one of Ben’s first steps – during the RFCsubmission in stage 1 – is to assign roles to people who will participate in the change management process. Ben authorized the change after reviewing the change details. The RFC was moved to planning, the next stage of the change life cycle. The ​change owner assigned by Ben analyzed the impact of the change, recorded the rollout and backout plan, and sent the RFC to Ben for approval. Before approving the plans, Ben reviewed them to see if the plans addressed the technical challenges and if they would ensure a smooth transition. Then, he moved the RFC to the approval stage. Ben sought the recommendations and assistance of the stakeholders, who constitute the Change Advisory Board or CAB. Then, the CAB analyzed the RFC from a business and a technical perspective and collectively shared their analysis with Ben. Based on the feedback and analysis from the CAB, Ben approved the RFC and moved it to the implementation stage. In the implementation stage, the ​implementer was responsible for creating a project to implement the change, breaking down the project into multiple tasks, and ​completing the change within the given change implementation window. 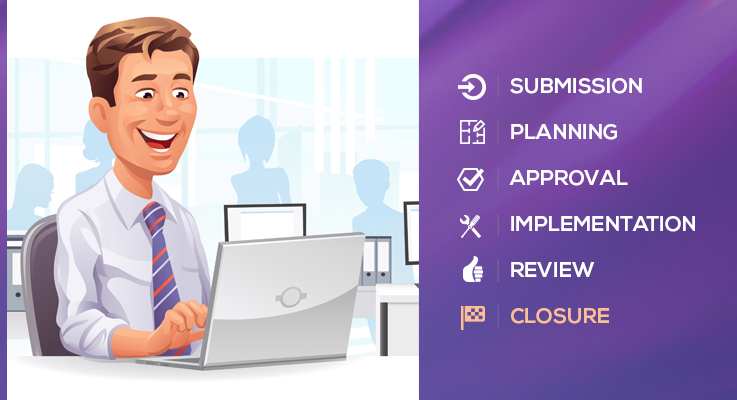 Ben reviewed the implementation after the implementer completed the tasks and the RFC was moved to the next stage, post-implementation review. In this stage, the ​change reviewer ensured that the desired results were obtained. The reviewer evaluated the change and informed ​Ben. Ben then informed the change owner and the ​change requester about the success of the change implemented and the RFC was moved to closure. After the change owner and the change requester were notified, Ben ensured that a closure code was applied to the RFC as ​Successful and closed it. With a new streamlined payroll software product in place, Ben is now able to do payroll calculations quickly and makes the pay day a joyful one for the employees. Click Admin > On-Premise Poller. Select the installation platform as Windows in the On-Premise Poller screen. Click on the binary type (32-bit or 64-bit) to save the software to the system. 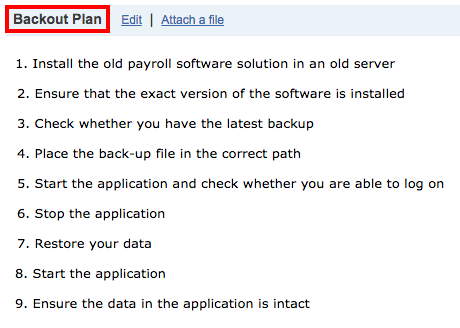 Click the downloaded file to open the On-Premise Poller Setup installation wizard. Click Next. Read the License agreement and click Yes to proceed. Enter your Device key when prompted. The Device Key can be obtained from Admin > Developer > Device Key. Follow the wizard instructions to complete the installation procedure. Once the device key is entered, you may need to configure proxy in the wizard itself, if you use one in your network. Enable the check box to use the proxy server. Mention the proxy details to communicate to the central server. Click Next. Click Ok to enable the proxy. Also provide access to the below domains and ports for communication between agent and Site24x7 server. You can view the added Poller for Windows under Admin > On-Premise Poller once the installation is complete. Now the added Poller will act as an another locations in addition to Site24x7 global monitoring location to monitor websites, web app etc. The On-Premise Poller location will be listed under Admin > Configuration Profiles >Location Profile. Click the settings icon next to Add On-Premise Poller in On-Premise Poller screen. This will help upgrade your agent when the new version is available. Click the On-Premise Poller which you want to edit in Monitors screen. Enter an appropriate display name for the added monitor. The host name, IP address, and the details of On-Premise Poller will be displayed by default. Select a threshold profile from the drop down list or choose the default threshold set available and get notified when the resources cross the configured threshold and availability. To create a customized threshold and availability profile, refer Threshold and Availability. 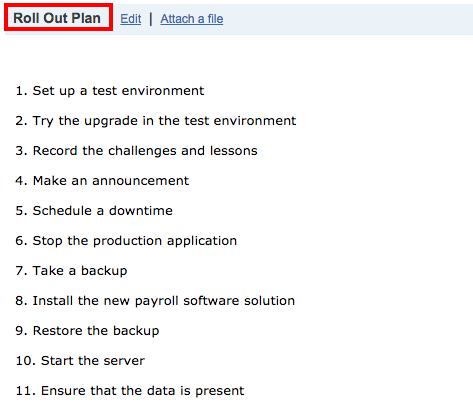 Select the user group that need to be alerted during a outage. To add multiple users in a group, see User Groups. 7 Service Desk Habits of The Avengers! You may have heard this many times from your help desk solution provider, if not from your customers and colleagues. Do you believe this notion? Do you really think you can be a superhero? Well, I believe you can. But let’s not get overzealous because with great power comes great responsibility. Nuking the army of Chitauri from outer space may not be your responsibility, but successfully neutralizing the end-user request ticket within stipulated time is. For performing the expected responsibilities, you don’t need super powers; however, you can learn some the simple habits of the superheroes. If there is something to take away from the habits of the S.H.I.E.L.D. director, it’s planning. Nick Fury is smart and sharp in his methods. He anticipates how and when a villain can attack, which soldier should go on a fight, and how to prevent future incidents. As a help desk technician, it is important to adapt this habit of planning ahead.You need to plan the help desk strategy and workflow. Ask yourself the following: What will be the modes of incoming tickets? How will you assign technicians to a ticket? How will you establish reasonable service level agreements and escalation policies? How will you communicate with end users? What will be the approval criteria and what will be your notifications/alerts settings? All this planning will help you streamline the workflow of your help desk and therefore better equip youto fight incident attacks. You need to know your IT environment and your end users because they are the source of your service tickets. Also, you need to have an information database of all the IT hardware and software details, as well as their relationships with the end users, business services, and each other. Ask yourself this: Do I have quick access to user details? Have I imported my assets inventory in my help desk application? Are there any recurring outagesin IT service that I need to plan for? Have I created different sites for different sets of end users who in turn have different configurations? Tony Stark is tech savvy. He loves to tame technology. This is why he built himself intelligent robotic exoskeletons that work via voice commands. The result was the creation of the heavily armed and powerful metal suit known as Iron Man. You need to learn this technology-taming habit from Tony Stark to automate and simplify your help desk operations. Automate your operations to simplify 1) ticket creation by creating logical templates, 2) ticket assignment through business rules, 3) ticket escalation by SLAs, 4) the triggering of recurring announcements and tasks, and 5) the creation of alerts and notifications for change of ticket status or even SLAviolations. Black Widow may be a master assassin, but she is better known for the way she talks to people and gets important information out of them. In one scene from Marvel’s The Avengers, Natasha (Black Widow)interrogates Loki to find out his plan. She never asks him the direct, obvious question. Instead, during the course of a normal conversation, she tricks him into revealing his plan of unleashing The Hulk – without Loki even knowing. That’s the habit of effective communication you can learn from her. You need to understand the details of requests from end users by asking them the right questions through effective templates. You need to acknowledge the tickets, query back to the customers, notify end users on changes in the status of tickets, and communicate about the resolutions and closures. Thor helped the people of Earth prepare for an attack from outer space. Being prepared helped the Avengersdefeat the army of Chitauri. Like Thor, you can help customers resolve their issues themselves by providing the right self-service portal. Advise them to use the self-service portal to create tickets, check the status of tickets, check solutions from the knowledge base, and check FAQs and technical tips. We know that Captain America is a soldier with a kind heart. However, he is stricter when it comes to fighting a war and putting up with his team mates. He loves fun, but gets angry when Tony Stark make jokes in a serious situation. Captain America has a good habit of analyzing situations based on facts. You can use that attitude. You should monitor and analyze the performance of your help desk technicians at regular intervals using reports on things like key performance indicators, SLAs, or even customer satisfaction. This will help you optimize the workload, structure service levels, and use resources efficiently. Hawkeye is a straight shooter and knows his targets well. But Hawkeye aims for more than that. Following the origin story of Hawkeye, he used to work in a circus where he saw Iron Man and was mesmerized by superhero life. He then worked hard to not only become a superhero, but to join Avengers and save the world. If you want to develop the habit of aiming at the target of a successful IT help desk, you should start by asking the right questions of end users. You need to regularly check to see if they are satisfied with your service. This will help you understand the performance of your technicians, the root causes of repeating issues, or any leak in the work flow. 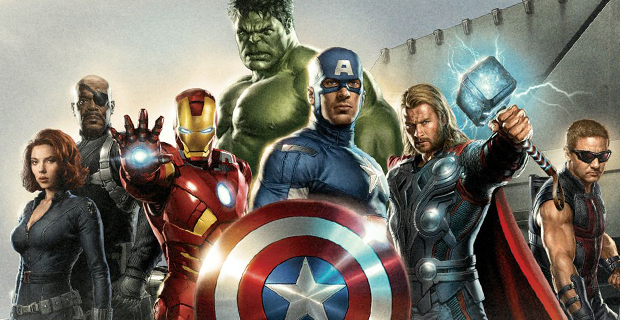 The above mentioned qualities of the Avengers might not be what they’re best known for, but they are qualities the rest of us can practice in real life. Running a help desk becomes much simpler and more efficient if you areprepared to work with the resources and application. Assemble those seven habits from the Avengers and create your S.H.I.E.L.D. – Service, Help, Information or Equipment-Lending Desk.